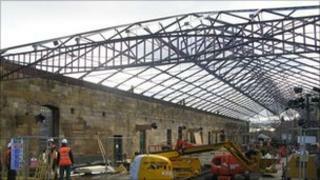 A scheme to restore a Victorian roof at a North Yorkshire railway station is close to completion. The North Yorkshire Moors Railway (NYMR) has spent £500,000 on the project. The original roof, which was installed in the 1840s, was replaced in the 1950s by British Rail. Work on the project is due to be completed in the next month as the NYMR celebrates the 175th anniversary of the Pickering-to-Whitby line. Funding for the project came from a Heritage Lottery Fund grant with additional support from Yorkshire Forward and donations from the public. A total of £1.6m was raised, which paid for the roof project and the creation of a new two-storey education centre at Pickering. The new roof will also provide additional support to the fabric of the 19th Century station buildings. NYMR spokesman Phil Bustard said the group considered itself lucky to receive the money. "Given the period of austerity the country is now in, I don't think we would have been as successful with our grant applications today," he said. The public also contributes more than £25,000 to the cost of providing more than 8,000 Welsh roof slates, by sponsoring a slate for £5. "It shows just how much people think of the work we do here," said Mr Bustard. "We had inquiries and donations from all over the world." The NYMR attracts more than 300,000 visitors each year and believes the heritage railway contributes around £30m to the local economy. The original roof was completed in 1847, when the York & North Midland Railway built its new station at Pickering. That structure was removed by British Rail in 1952 due to serious corrosion. Sir Mark Sedwell's letter to ministers comes amid pressure for a more robust response to the Huawei leaks.